Our Mobile payment channel gives your customers the ability to make payments right from their mobile phone or tablet. Your customers have come to expect anytime, anywhere access to their personal data. PayConcierge Mobile make this a reality with fingertip access to their invoices and payment history. For those payers who choose to use their mobile device to pay their bills, we optimize the screens for an app like experience, without the need to download and manage an app. 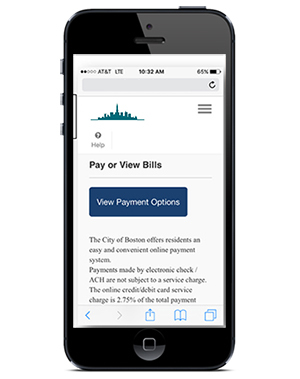 Customers can view and pay their bills and the payment will directly affect the status of the presented bill. In a typical transaction, a customer views the information of a bill, together with access for suitable payment options. Customers can then choose to pay the displayed bill by selecting a method of payment and initiating the transfer of funds. Significantly improve the mobile experience for customers that offers a fully mobile optimized portal and a Pay-by-Text option.